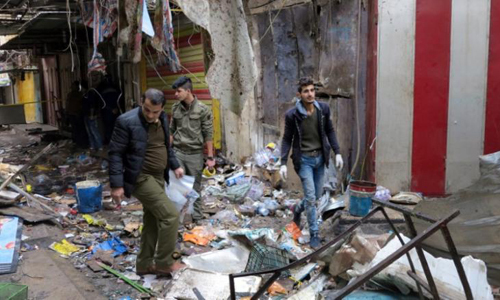 BAGHDAD – Two bombs exploded at a busy market in central Baghdad on Saturday, killing at least 25 people and wounding more than 50, police and medics said. There was no immediate claim of responsibility, but Islamic State regularly attacks civilians in the Iraqi capital. Police said the blasts went off near car parts shops in Sinak neighborhood during the morning rush. One of them was triggered by a suicide bomber, the other was a planted explosive, an Interior Ministry official told Reuters. Civilians picked through the debris of the explosions including a food cart torn apart by the blast as medics carried off the casualties. Islamic State has lost much of the northern and western territory it seized in 2014 and is now resisting an Iraqi offensive on the northern city of Mosul, the ultra-hardline group’s last major stronghold in the country.